At SXSW and SXSW EDU March 3-8, CZI will highlight its efforts to equip those on the frontlines with tools and research to accelerate change in education, science, and criminal justice reform. 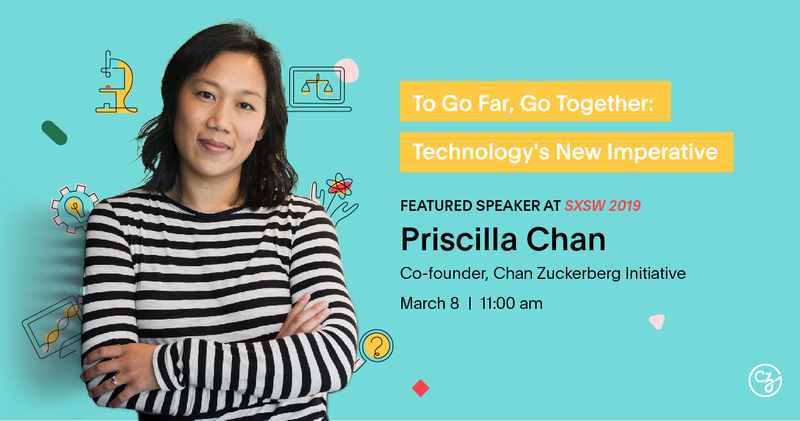 Today, the Chan Zuckerberg Initiative (CZI) announced it will participate in South by Southwest (SXSW), sharing a series of learning experiences and programming at SXSW EDU and SXSW Main Stage. Co-Founder Priscilla Chan, along with classroom practitioners and CZI leaders in research, technology, and public policy, will highlight our efforts to empower teachers with the necessary tools and research to ensure that every student enters adulthood with the skills and abilities they need to reach their full potential. Of note, CZI programming will include a teacher-led Show + Tell demo of the Summit Learning Platform to showcase how this online tool — developed with support from CZI’s technology team — enhances the quality of student-teacher interactions and helps teachers tailor instruction to the needs of each child. Thursday, March 7 | 2:00 p.m. to 3:00 p.m.
CZI Vice President of Learning Science, Dr. Bror Saxberg and Director of Whole Child Development, Dr. Brooke Stafford-Brizard will speak on the connections between classroom practice and the latest scientific discovery in learning science and human development — and why these links are critical to ensuring that all students receive an education tailored to their needs and supportive of every aspect of their development. CZI Co-Founder Priscilla Chan will describe CZI’s efforts to accelerate progress towards a more inclusive, just, and healthy future by pairing technologists and engineers with people on the frontlines of science, education and criminal justice reform working to solve society’s most pressing challenges. Monday, March 4 | 11 a.m. to 1 p.m. In this hands-on workshop, learn how to design learning experiences around principles like motivation and cognition, and in ways that account for students’ holistic developmental needs. CZI Vice President of Learning Science Dr. Bror Saxberg will lead this workshop with district leaders and practitioners. Thursday, March 7 | 11:00 a.m. to 11:30 a.m. Follow a teacher and CZI product manager Marie White in this live demo of the Summit Learning Platform, an online, educator-inspired tool that enhances relationships between students and teachers and enables instruction customized to each child’s learning pace, style, and needs. Monday, March 4 | 3:30 p.m. to 4:30 p.m. Hear from learning scientists, including CZI Director of Learning Science Katrina Stevens, about how edtech can help make research on how people learn more actionable in real-world classrooms. Tuesday, March 5 | 12:30 p.m. to 1:30 p.m. Learn about how local efforts to increase innovation and collaboration between public and private sectors are expanding opportunities for students. CZI Innovation Clusters Program Manager Ajoy Vase will speak alongside community organizers and school operators. How do we ensure academic rigor for students while also honoring their holistic developmental needs? Hear from experts on student-centered learning, including CZI Director of Whole Child Development Dr. Brooke Stafford-Brizard. Discover how experts are approaching the need for K-12 education to keep pace in preparing students to succeed in a world where skills and jobs are evolving more quickly than ever before. CZI Fellow John Bailey will participate in this panel. Wednesday, March 6 | 2:00 p.m. to 3:00 p.m. Hear about efforts to advance diversity and equity in the personalized learning space — from leadership and design to implementation and outcomes for students. This panel is moderated by CZI Advisor in Education Jim Shelton. Explore new research findings relating to education in the nation’s 39 gubernatorial races last fall and implications for state policy priorities moving forward. CZI Director of Policy for Education Justin Barra will share along with Seth Gerson, Program Director in the Education Division of the National Governors Association. Thursday, March 7 | 1:30 p.m. to 3:30 p.m. Examine new workforce solutions for the 21st century, grounded in city ecosystems and reflective of our rapidly changing times. CZI Director of Learning Science Katrina Stevens will join civic engagement, higher education, design, and entertainment experts on this panel.